Best fundraising scam ever… Wish we’d thought of it! 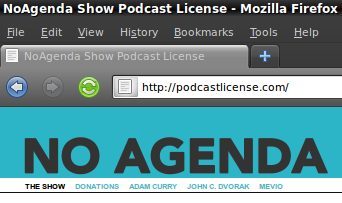 So I was listening to No Agenda #308 last night… Apparently one of their fanatical listeners went ahead and registered PodcastLicense.com, which thrilled co-hosts Curry (no relation) and Dvorak no end — they immediately started riffing on how they could dupe stupid people into unknowingly supporting their show by handing out bogus podcasting licenses at $100 a pop. Sadly, the morning after I see that the domain merely redirects to their podcast site, a wasted opportunity if you ask me. A quick search reveals that PodcastLicence.ca is still available — should we grab it? Previous Previous post: Canada’s tech gurus — whither the other two? Next Next post: Von Finckenstein in Toronto for Telecom circle-jerk.